December 2014: Clinton’s emails are copied to a different server, but the FBI will never check if that server had any of her work-related emails. 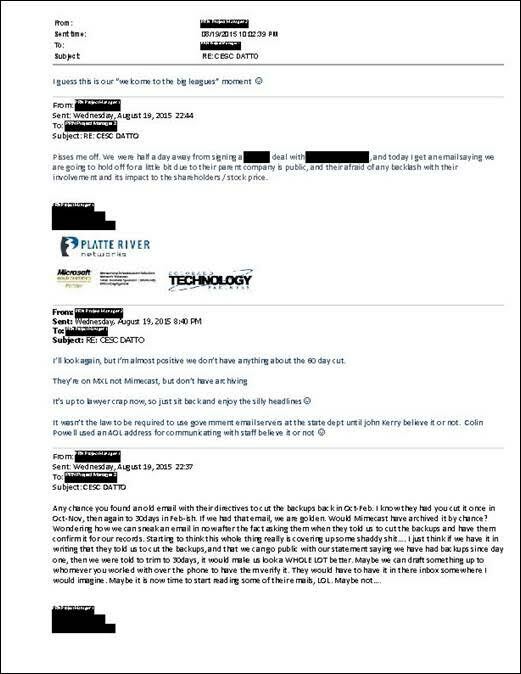 Paul Combetta is the Platte River Networks (PRN) employee doing most of the active managing of Clinton’s private server. In a September 2015 FBI interview, he will claim that a person working for the Clinton family company Clinton Executive Service Corp. (CESC) whose name is later redacted contacts him around December 2014 and tells him that Clinton and her aide Huma Abedin are getting new email accounts on a different server not administered by PRN. Indeed, other sources indicate that in December 2014, Clinton and Abedin get new email accounts on a server with the hrcoffice.com domain name. However, Clinton’s earlier emails could have been transferred to her new email address around the time it was created in late March 2013, in which case they too would get copied to the hrcoffice.com server. But the FBI will never search this server to see if any of Clinton’s emails from her tenure as secretary of state can be recovered from it. March 3, 2015: The head of the company managing Clinton’s private server makes a curious political comment; he also wonders what Clinton emails might have to turn over. PRN is the company that has been managing the server since June 2013. There will later be suggestions that PRN was chosen by Clinton or her employees to manage the server at least in part due to the company’s political preference for Democrats, and this email seems to fit with such a preference. At the time, Jeb Bush, the former Republican governor of Florida, is seen as the Republican frontrunner for the November 2016 presidential election, though he will ultimately fail to win the Republican nomination.